She wandered around the cliffs at Martin's Haven, and then jumped aboard a boat which went around Skomer Island, and there, on the sea, she saw puffins. Puffins! She found them to be delightful. 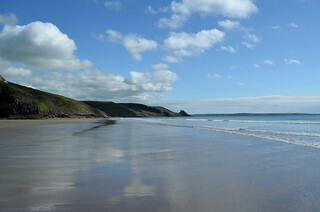 Later that day, the sun shone and she walked on the sandy beach of Newgale, which had two miles of sand, and she looked at the reflections of clouds. Actually, walking there, made her happier than the boat trip had.